Company Overview: A multi-billion dollar conglomerate trading on the New York Stock Exchange, the company manufactures three main product line: 1) industrial chemicals, 2) metal alloys, and 3) ammunition components. The company is headquartered in the central United States and employs over 6,000 workers. Plan Design Summary: Before meeting with KTP, the company maintained numerous retiree medical plans with varying benefits, contributions and structures. This was due in part to the assimilation of past acquisitions, the existence of collectively bargained agreements and the general evolution of plans over time. This is a very typical situation for large companies with multiple geographic locations and product lines. Initial Results: KTP met all of these goals on an extremely short timeline. The time that elapsed from the company’s authorization of the plan to completed enrollment of a customized solution was only 29 calendar days. The KTP designed plan covers over 2,000 retirees including their spouses and dependents. 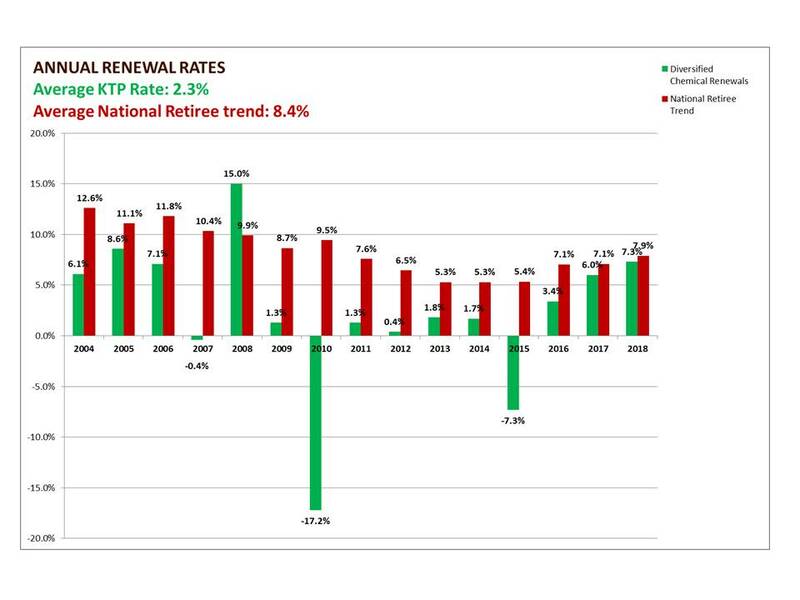 Annual Renewals: Since the company began working with KTP, the average renewal rate has been 6.3%, significantly below the average national trend for similar retiree plans of 10.3% (see chart above). The 7.1% renewal rate in 2006 was well below the national average of 11.2%; however, the 2006 renewal rate is even more impressive considering the fact that it was accompanied by a dramatic increase in Rx benefits from the previous year (brand name prescription drug coverage increased approximately 25%). A portion of these savings were realized by shifting to an Employer Group Waiver Plan in 2006 under the then new Medicare Part D benefit. Without engaging in a competitive process, the company would have witnessed a 9.51% renewal increase in 2007 without any improvement in benefits. The sharp increase of 15.0% in 2008 was more than offset by the dramatically lower rates than in 2007 and 2009. For the 2010 plan year the Rx plans were consolidated from two plan designs to one in order to eliminate potential adverse selection.